Our rapidly ageing population is very much in the news, with the ongoing debate in Parliament on the Budget and the impact of an ageing society on public finances. Singapore reaches a population milestone in 2018: The total number of senior citizens at 65 years and older equals the number of young people at 15 years and younger. Singaporeans are not merely ageing fast. The number of deaths each year is expected to increase rapidly as baby boomers advance into their 80s. By the year 2030, the total number of citizen deaths per year is likely to exceed the number of births. The large cohort of baby boomers, defined as those born in the post-World War II economic boom period of 1945 to 1964, coupled with steadily falling birth rates in more recent decades, has resulted in an inverted population pyramid. Today, that generation of baby boomers is aged between 54 and 73. Assuming that both the fertility rate and the mortality rates of the various age categories of Singaporeans remain constant, we will reach a milestone where deaths exceed births in the year 2030. So far, the discussion on an ageing population has largely been focused on the costs of healthcare and social support. It is time to consider the impact on another area - public housing. The increasing deaths and a reducing base of young people have huge implications for public housing. To understand the impact of the ageing population on public housing, some background is important. The Housing Board's housing programme was ramped up quickly in the 1970s and 1980s to supply more than 550,000 flats over these two decades to meet the needs of a million baby boomers who were setting up families. By the 1990s, the percentage of Singaporean families living in HDB flats shot up to 87 per cent, from 35 per cent in 1970s. Private residences, though slower off the mark, were developed rapidly from the 1990s. Today, about 80 per cent of Singaporeans live in HDB flats and 90 per cent of households own the homes they live in. A large proportion of baby boomers own and live in HDB flats that are 30 years or older. When they die, their flats may be inherited by their beneficiaries or resold on the open market. However, with 90 per cent home ownership, most of the beneficiaries would already be HDB flat owners. Under current HDB rules, they are not allowed to inherit the flat from their deceased parents. In cases where there are multiple beneficiaries, they might opt to sell the flat and distribute their inheritance as cash. Hence, the number of flats put up for resale will likely escalate as cohorts of baby boomers age and die. Estimates from the latest population data and mortality rates show that the number of senior residents dying will exceed 30,000 per year by 2030, about 21/2 times the number in 2016. While the number of new flats released by the HDB can be controlled, the supply of resale flats is something that policymakers have little control over. By 2030, flats made available for resale due to the deaths of the owners may make up more than 8,000 units. That is equivalent to about 40 per cent of the number of resale transactions per year in 2016 and in 2017. The increased supply of resale HDB flats faces another challenge: slowing demand from young couples. Birth rates have trended down since 1998. The demand for HDB flats in and around 2030 will depend on the millennial generation. Not only is this group smaller in number than baby boomers, they may be less inclined to own homes, given their familiarity with the sharing economy and irregular income streams from the gig economy. Just as millennials are eschewing car ownership for car-sharing options, they may prefer to rent or adopt a co-living arrangement for their home. Those who want to buy their own homes have abundant choices beyond resale HDB flats: new, subsidised HDB Build-To-Order flats, new and resale private residences and executive condominiums. Even as a larger supply of resale flats comes on the market from a passing generation of baby boomers, demand will go down due to a shrinking youth population. The widening gap between supply and demand will add significant downward pressure on resale prices. Compounding the issue is the ageing of HDB flats, which are sold on 99-year leases. The depreciation of old HDB flats steepens from the point of 40 years of age and by 2030, more than 400,000 HDB flats will be left with a remaining lease of 59 years or less. This is likely to lead to lower prices. To lessen the impact, Singapore can attract more foreigners to become permanent residents and citizens to boost demand for resale HDB flats. But that is contingent on the economy creating tens of thousands of additional jobs every year and remaining attractive to foreign migrants. Alternatively, HDB can loosen "ownership" rules to allow beneficiaries to inherit HDB flats, even when they already own a flat. Subletting rules may then have to be relaxed so the flats will not remain vacant. I would strongly recommend a third option. In death-related and inheritance cases, the HDB could repossess the flats at the prevailing resale value, allowing the beneficiaries to divide the cash proceeds. This gives the HDB a larger stock of rental flats so that the public has more housing choices. The HDB could also refurbish the newer flats acquired and offer them for resale under the Sale of Balance Flats scheme - at prices that take into account the remaining years of lease. In the past 40 years, the focus has been on ramping up the supply of flats, providing Singaporeans with homes and appreciating assets. 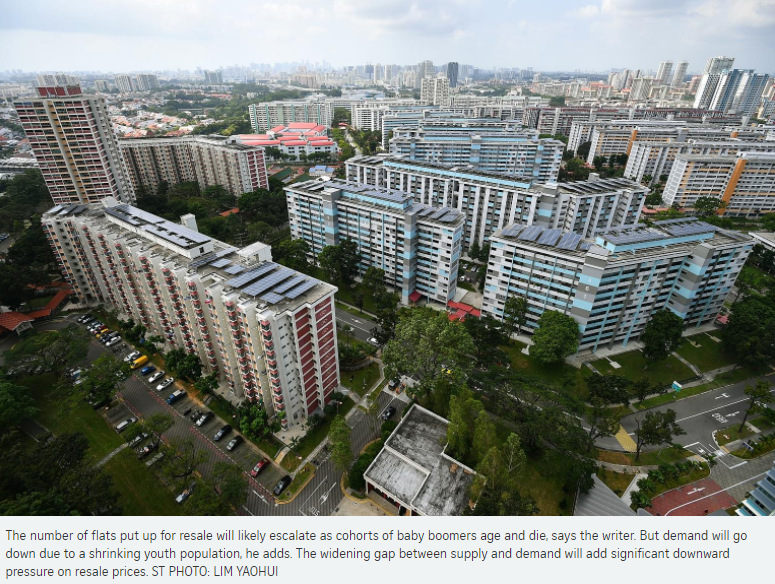 It is perhaps time to start discussing unwinding these old flats, so that increased supply and falling demand from an ageing population do not cause a collapse in HDB resale flat values that would have a knock-on effect on the overall housing market. It is not too early to start considering how the rapidly ageing population and the deaths of baby boomers may add downward pressure on home prices. There is light at the end of the tunnel if due attention is given to the impending supply avalanche and effort is made to work towards implementing solutions. The writer is a licensed real estate agent and chief executive of International Property Advisor. We refer to the commentary by Mr Ku Swee Yong (Prepare for supply avalanche as ageing HDB flat owners die; March 5) and the letters by Dr Thomas Lee Hock Seng and Mr Teo Kueh Liang (Glut of HDB resale flats may not materialise, and Policy tweaks can prevent supply avalanche; both published on March 7). With regard to the concern about a future glut of Housing Board flats, we would like to assure Singaporeans that HDB calibrates its supply of new flats carefully, not just to meet housing demand in the short term, but also with a view towards longer-term demographic and population trends. In planning the new supply each year, we account for the existing flats that will be released into the resale market due to situations such as the demise of sole owners. This ensures that the pace of supply injection is sustainable for the entire housing market. Besides determining the flat supply, we also have other measures such as financing rules and ownership conditions. For instance, we tightened financing rules for HDB flats in 2013 to temper market exuberance and encourage financial prudence among homebuyers. We will continue to monitor the housing market closely and review our policies to ensure they remain relevant, and to promote a stable and sustainable public housing market.